Howard, second from right, with his family. How’d you get into this industry? I first started pursuing a college engineering degree, but had to leave due to some family emergencies. In 1982, I started selling lumber and trusses for 84 Lumber and then with a local lumberyard a year later in my home area of Portage, Indiana. When construction tanked in the early 1980’s, I moved my family to Florida near my wife’s family. I decided to use more of my background from college and found a job in 1985 estimating floor and roof trusses for WD Lumber & Truss in the Tampa Bay area. It was not long after, in 1994, that I accepted a job with my current employer, Carpenter Contractors of America (CCA), as a designer and soon trainer. In 1996, CCA decided to bring back their components division in the Chicago market supporting their long-time framing division, R&D Thiel. I was asked to be part of the restart and accepted the job as truss engineering department manager. Since then, I have endeavored to be an active part of the industry through SBCA and TPI issues. What’s your favorite part about being in this industry? I have many favorites, but I would place solving a hard problem as one of the top. Whether it is a new plan that a builder wants help figuring out, helping a designer with a complex issue, or helping to work out production issues. Another would be participating in SBCA and TPI committees over the years. I can honestly say I have enjoyed meeting and working with so many wonderful friends. What could you do without? I find it difficult to pinpoint what I can do without in the industry, because everything is part of the problem solving process, which I enjoy. But I do not particularly enjoy letting customers know when they have come up with an idea that is not a wise practice. Usually, they have already gone too far down the road with their plans and permits so they are resistant to any changes that will end up saving them money and service problems. To solve this, we have built relationships with most builders to make us a part of the planning development process. This has obvious benefits for both of us. What’s your company, market, or SBCA chapter focused on right now? I’m sure most CMs have similar goals as we do, which is to increase our market share by building relationships with our builders. We have a company motto displayed in our conference room that says, “The Customer Is King.” We really live by this, and find above all of the other things we do, this is by far the most important. As for our chapter, we find ourselves in the same boat as many other chapters: Rebuilding our membership and participation after the downturn. We plan to help CMs see the benefits of not only membership in the SBCA locally and nationally but also in participating by showing the numerous resources for the all-too-familiar issues that many have already dealt with, and the real value in having a voice in the decisions that affect our industry and our bottom line. What challenges do you see for the industry in the future, and what should SBCA be working on now to meet those challenges? What concerns me the most is training the next generation. Every aspect of construction and component manufacturing has felt the pains of an aging workforce and the need to get a younger generation interested, involved, and then trained. I know this is not new, you just need to ask any company and they will tell you about how they have a plan to find and train employees. Most will also say that it is an ongoing, and necessary, process for every part of our business. This is good, but an aspect of this that still concerns me is the lost knowledge base that typically comes from the experience of trial and error – the knowledge that comes from handling odd or special conditions, or from diagnosing an issue that came up. From time to time, we see some of these same lesson-learned items come back up as a new generation of builders and architects get involved in the industry. So how do we find a better way to document this knowledge, put it into an easy to find/train format, and get it into the hands of the next generation so that they do not also need to learn these lessons via the school of hard knocks? 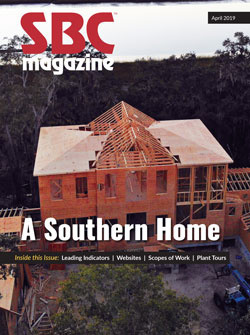 I do think that SBCA is already moving to work on this by updating and modernizing the Truss Technician Training programs, documenting many of these items in the pages of SBC Magazine over the years, and through the efforts to involve the “Emerging Leaders” into the association and the industry. When you’re not thinking about trusses, what keeps you busy? My wife and I would both say our favorite pastime is spending time with our children and grandchildren. My family and I are very involved in our faith and spend a lot of time volunteering. We also love spending time outdoors and camping whenever we can. I do like to spend time gardening but I must admit that I keep things simple as my thumb is not so green.